Naughty Dog's popular platforming series takes a radical turn with the release of Jak X: Combat Racing on the PS2. While this move may shock some gamers, the last two Jak titles had significant racing components, so isn't entirely unexpected. The game feels like a cross between Twisted Metal and Wipeout, with weapons and power-ups scattered on each course. 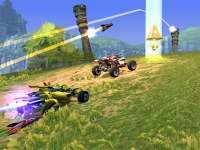 Jak X offers standard driving with combat in arenas and open-ended gathering challenging races to encompass several racing genres in one package. Fans of the series can take some solace in the storyline that occurs between races in cut-scenes, but the emphasis is on the racing action. While this might seem like an odd change in direction, read our review and find out how Jak X takes a new spin on this established franchise. Even though Jak X is technically the fourth installment in Naughty Dog's successful PS2 franchise, it really doesn't have much in common with the previous games. While the series has continually broadened its horizons over its first three installments, adding different types of gameplay as it moved along, Jak X significantly narrows its focus onto the racing aspects introduced last year, while completely losing the last vestiges of the platforming title it started as. This move will doubtlessly displease longtime fans of the series, but the initial storyline really ended at the end of Jak 3, so this can be seen as an extra chapter or an interesting post-script on the series. It's not an entirely unprecedented move on Naughty Dog's part, either. Their last franchise Crash Bandicoot followed a similar pattern, with a racing title ending the series' PS1 run. That said, for what it is, Jak X is a pretty decent racer that offers solidly entertaining and challenging racing action in a mold that mixes elements of other popular racing franchises. The gameplay is consistent throughout with a solid mix of racing mechanics and power-ups to make for some intense races. The twist here is that since Jak and his friends, (including the ever-annoying Daxter) have been poisoned by the evil Krew, one of the underworld heads in . 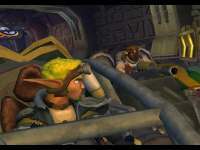 After his death, he invites the best racers including Jak to a meeting in Kras City. He tricks them and they find themselves forced to enter a deadly series of races. If they don't win the championship, they'll die. This sets up the game's main goal, where only first-place finishes matter. To help prevent monotony from setting in, there are several types of races in the game. There are 24 unique racing courses in the game, along with 8 open combat arenas. In addition, Jak X includes a cast of ten different racers you can play as during the game. You have standard lap races, which take place on a variety of tracks throughout Jak's world. Each of these tracks has a unique set of parameters and turns. Along each track, players will find a variety of powerups to collect by running over them. There are yellow Eco power-ups, which equip your vehicle with weapons including machine guns and missiles. Running over the Red Eco powerups gives the player access to rear mounted and defensive weapons such as shields, deflectors and mines. Finally, there are blue Eco power-ups, which increase the amount of turbo boost you can collect. The rules are simple - whoever crosses the finish line first wins, but the opponents are quite aggressive and will attack you relentlessly regardless of your position in the race. After you complete each race, you are awarded a number of coins depending on how you finish and how many times your vehicle was destroyed. Obviously, you win more when you win a race. You can use to purchase vehicle upgrades including enhanced turbo boosts, increased armor, better tires, and other vehicle upgrades. As players win races, they'll also unlock additional courses and areas and are given a number of freebies such as new parts when they win races. In addition to these standard racing modes, Jak X includes several interesting variations that add replay value to the experience. There's a Twisted Metal style combat mode that takes place in tightly wound arenas, where you have to destroy more vehicles than your opponents before the timer runs out. You'll find the same types of weapons power-ups in the arena, with a huge number of weapons, plus health and other items. Other race types have you blazing down a course trying to destroy a set number of opponents. Another mode has you collecting freeze icons to stop the clock to try an beat a set time. 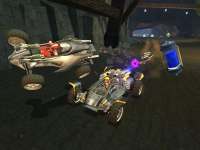 In all, the game offers six distinct racing types, all of which you need to complete and race in order to progress in the story mode. These races don't necessarily need to be completed in order, giving Jak X a pleasingly open-ended structure that makes it more approachable than many other racing titles. During the course of the story mode, you'll traverse a number of areas in Kras City ranging from dank sewers, to narrow city streets and deadly arenas specially constructed for combat racing, many of which feature secret areas and branching paths, adding to the challenge. This gives the game's environments a great deal of variety as you race through different areas, each posing a unique challenge. Additionally, winning races in these during the story mode allows you to play them in single race modes or online against other players in single matches. Its different types of racing modes help to offset the tedious nature of most racing games and definitely give Jak X a high degree of replay value. Adding more replay value is the online mode which allows up to six players to compete against each other in online with a broadband connection. This is a cool feature, and offers the same intense gameplay as the solo modes, with the same gameplay types included as wel. Obviously, any racing game worth anything should offer players smooth intuitive controls, and Jak X does this nicely with vehicles that are both responsive and easy to operate. Most of the basics are outlined in a series of relatively painless training levels that teach you how to control the vehicles. Most of the operations are fairly easy to perform, though more advanced moves like power-slides take some practice to get the hang of. During each race, you can steer and fire weapons using the analog stick and the shift buttons, and can also give your vehicle a slight vertical boost by jumping. The onscreen HUD is also simple in approach, allowing you to see where opposing vehicles and power-ups are at a glance. Jak X's controls work beautifully throughout, allowing you to move your vehicle fluidly during standard racing. In addition to using the radar, opposing players are indicated on the screen itself with arrows, making them easy to locate, even from a distance. Naughty Dog and SCEA deserve credit for making the game so accessible, while not losing sight of the critical aspects - creating a sense of speed and tension throughout the race. From an aesthetic standpoint, Jak X looks good for an arcade style racer on the PS2, with large expansive racing environments that do an excellent job of immersing players into the action. Each track definitely has a unique feel to it, with light sourcing and texture mapping used extensively to create a cool looking world. The design of the racing vehicles is interesting, with each one given a unique look and feel, that extends past the skin to other attributes such as speed and maneuverability, which makes it important to select the right one before each race. The trade-offs also include a balance between defensive armor and weapons power, and the amount of air time your vehicle has with each jump. The action unfolds at a fast, consistent frame-rate throughout, with excellent camera angles zooming in and out onto the twisting courses to lend each race a sense of drama. Adding even more excitement to the race, Jak X switches to a slow motion, trackside view whenever there's a spectacular crash, giving you a great view of the unfolding carnage. While this is a racing game, there are many between race cut scenes that tie in with the action, giving you a sense of the storyline that unfolds and the sense of danger that motivates Jak to finish first, since his life, not just pride is on the line. Obviously, the game's plot isn't as elaborate as it was in previous Jak titles, but the developers have done a decent job keeping the events and story consistent with the series' first three games. While this installment will probably surprise gamers who were expecting another platform adventure, taken on its own merits, Jak X succeeds as an above average racer. It's controls are smooth, intuitive and responsive, making the gameplay easily accessible. Using elements of other popular racing franchises makes the game feel somewhat derivative in places. There are portions that almost directly resemble both Wipeout and Twisted Metal, but Jak X offers this mixture of racing styles held together by its own mythology and storyline, so it feels natural instead of a pasted together. Jak X's pacing benefits from its non-linear structure, which allows players to progress through the missions in whatever manner they wish, giving you a small sense of freedom. However, the upgrades, tournaments and qualifying races give the gameplay a clearly defined path to improvement. While its unlikely this will be seen as the most-memorable game in the franchise, Jak X is a solidly entertaining and challenge arcade racer that offers some exciting action, varied game types and some challenging missions. It doesn't reinvent the wheel, but this is a fun game in an accessible package that should please fans of arcade-style racing.